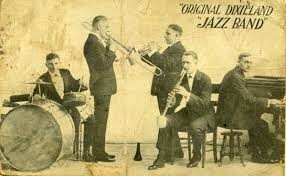 The three main music types that lead to the start of jazz music were Ragtime, Dixieland, and Swing music. Jazz brought together the syncopation of Ragtime, the progressions of Dixieland, and the rhythm of Swing music. This song is composed by Orie Frank Trumbauer. In the recording above the trumpet soloist is the famous jazz trumpeter Bix Beiderbech. It was written in 1927 and is a tone poem. A tone poem is a piece of music based on a story and what the composer believes the musical representation of that story is. 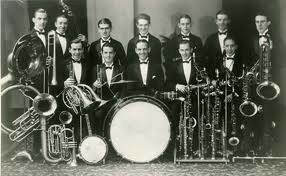 Jazz bands generally were comprised of trumpets, clarinets, pianos, drums, saxophones, trombones, and the occasional string instrument (other than piano). The photos above were taken in the 1920s when jazz groups were the most popular source of music. During the 20's, society had loosened its morals and behavior from the general public was more risqué. Jazz music evolved with society to reflect these values. 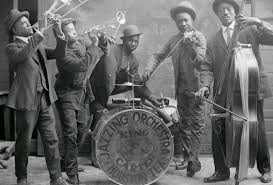 During prohibition jazz music became largely popular in the "underground" clubs and bars selling alcohol. At almost any illegal lounge you would find a live jazz band. After the ban on alcohol was lifting this tradition continued but on a much larger scale. Everyone everywhere new the current jazz artists and who was the best. Performance tickets sold almost as quickly as the alcohol did. Two of the three instruments I am currently playing are piano and trumpet, the two biggest jazz instruments. My personal favorite type of piano jazz music is Ragtime. Unlike my favorite trumpet music (swing), Ragtime music is very straightforward and focuses on syncopation more than anything. The following video is of me playing the introduction to Maple Leaf Rag by Scott Joplin. Joplin is the most prominent Ragtime piano composer and is one of the founding fathers of jazz.